A listing for Bully 2 popped up on Game Informer's website, but it appears to have been an error, and not a leak. With E3 less than a week away, it's time for the really juicy rumors to pop up, and this one is just that. A listing popped up on Game Informer's website for a sequel to Rockstar's 2006 game Bully. 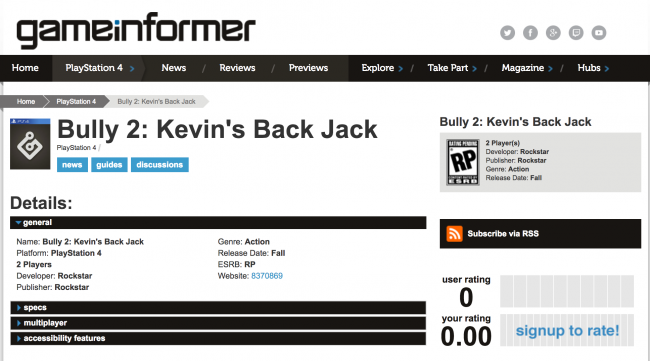 It showed a game titled Bully 2: Kevin's Back Jack, and listed it as a PS4 exclusive. You can see a screenshot of the listing below. But don't get your hopes up just yet. The listing was quickly removed, and Game Informer's official Twitter account quickly squashed the idea of its significance, saying, "You might be seeing reports we have reported Bully 2 exists. This is in error. 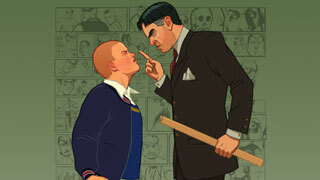 We have not heard anything about a sequel to Bully." So which is it? Did someone at Game Informer make a giant data entry error? Did the website accidentally reveal a game we weren't supposed to see until next week? It's hard to say, but luckily, we won't need to wait too long to find out if Bully 2 is real, as E3 kicks off next Tuesday, and Sony's press conference is Monday night. Finally, an opportunity for Take Two to monetise us even more, like the sub-human garbage that they see us. Just like school in real life.